When it was time for us to leave Mostar, we were supposed to be heading back to Croatia but we just weren’t ready to leave Bosnia yet. 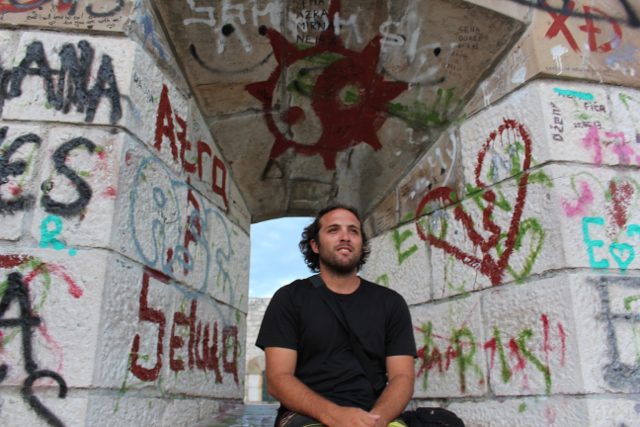 Both Ronen and I had fallen in love with the country and the people and after our Dubrovnik experience, we weren’t super excited to return to the Croatian “hospitality”. 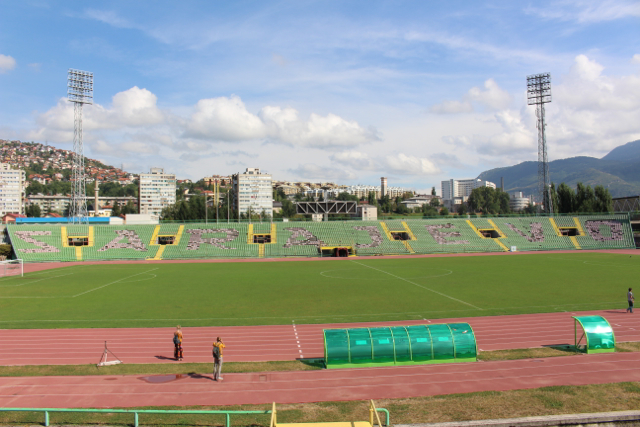 So, we changed our itinerary a bit and headed to Sarajevo for the next three days. The bus ride from Mostar to Sarajevo was beautiful. I had no idea how gorgeous Bosnia Herzegovina is! We drove along a river, passed lakes, and through mountain roads. It was truly stunning. 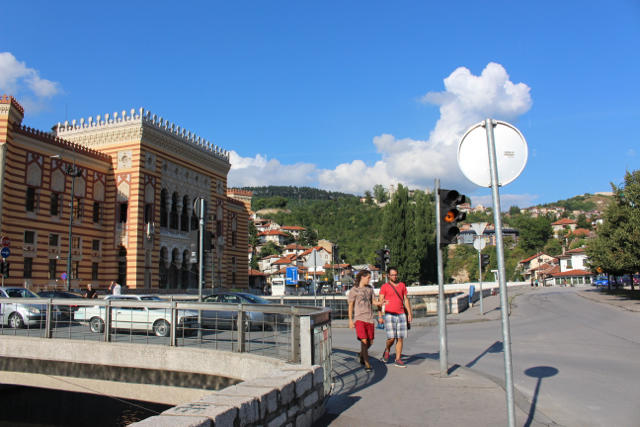 When we arrived to Sarajevo, we took the tram to the Old City area which was where our hostel, Haris Youth Hostel, was located. That evening we met a few other people who would end up becoming great friends by the time we left. 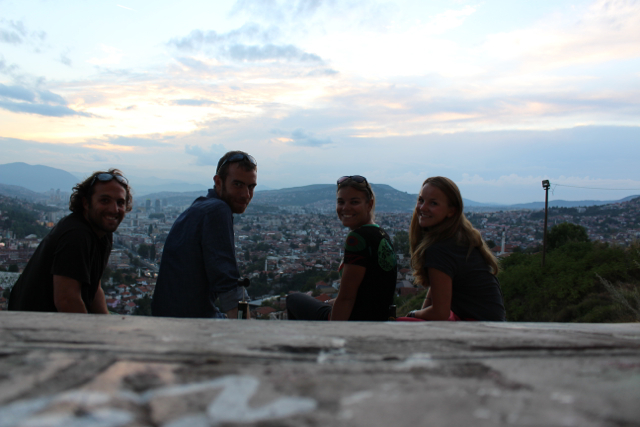 Its kind of funny how life works that way, Kashia, Mike and Haris, thank you for making Sarajevo that much more incredible for us! 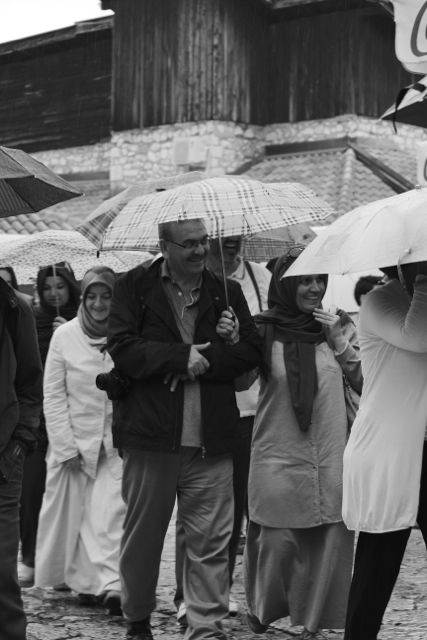 Haris does a tour everyday around Sarajevo and we signed up for it for the next morning. It’s a wonderful way to see a lot of the city and learn a ton in the process. The first thing Haris will say is, “Come to Bosnia for the scenery and the people, not for the war history.” In his tour he does a good combination of war history as well as visiting sites that are a bit more upbeat. Our first stop was the Tunnel Museum. 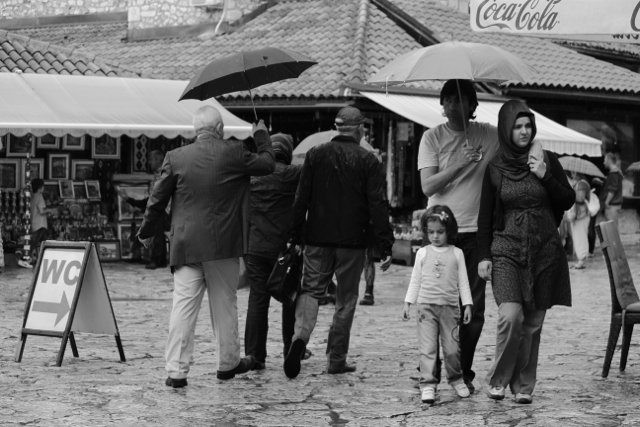 During the war, Sarajevo was surrounded by Serbian troops and they had no way of getting food or supplies into the city. To solve that problem, they dug a tunnel from inside the city to outside into free Bosnian Territory. The men would walk for days to get supplies and then carry 60 kg on their backs and 20 kg on their fronts all the way back to the city in a tunnel that was just 1.6 meters tall. 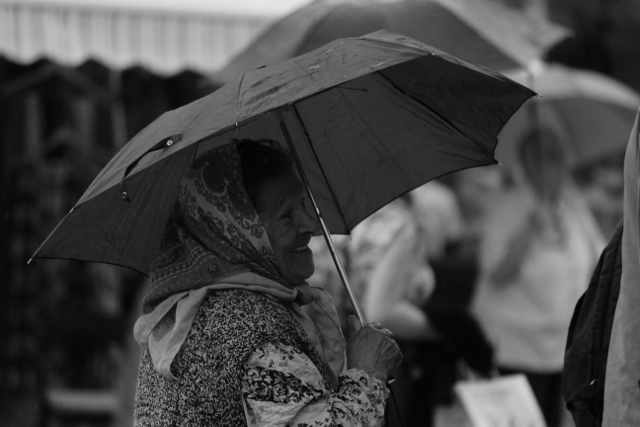 It was risky and dangerous but it had to be done in order for people to feed their families. 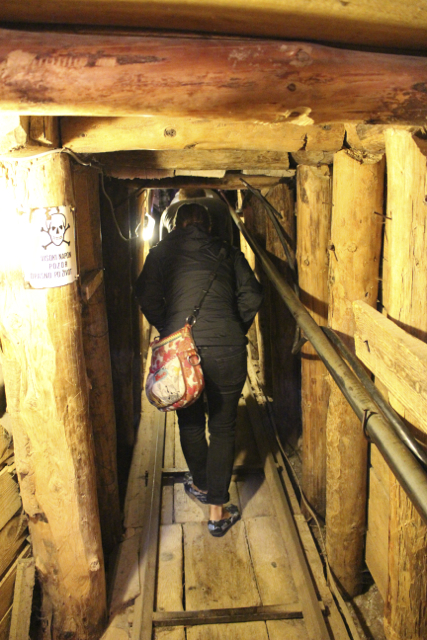 A small section of the tunnel is still intact and the museum keeps it in good condition so we were able to walk through it. While I was walking, hunched over, I was imagining carrying my big pack which is only 20 kg and I couldn’t even fathom carrying three times that much weight for days hunched over like that. 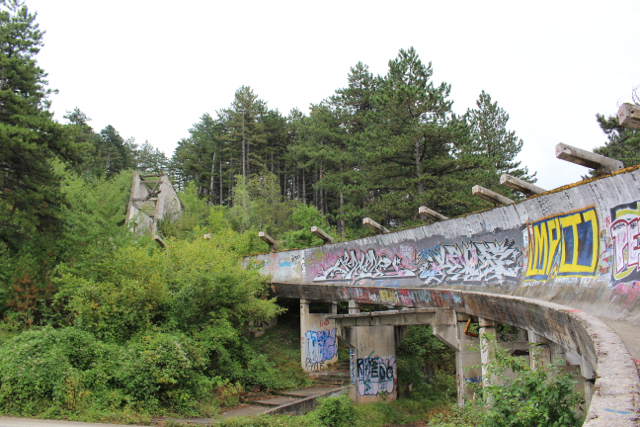 After the Tunnel Museum we went to see what remains of the bobsled course from the 1984 Winter Olympics that was hosted in Sarajevo. 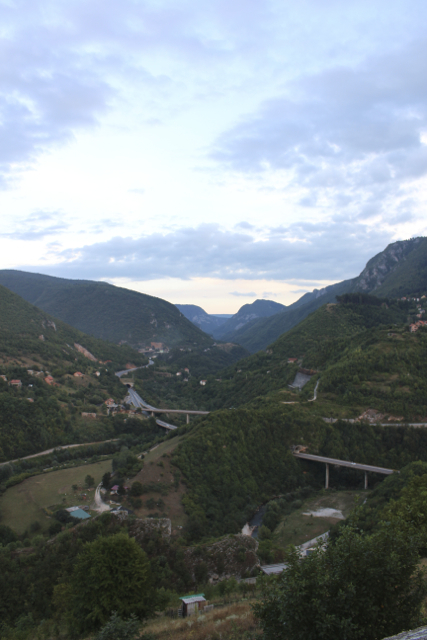 On the drive, we went up a mountain and through a beautiful forest with pine trees and I was again, taken aback by the beauty of Bosnia. 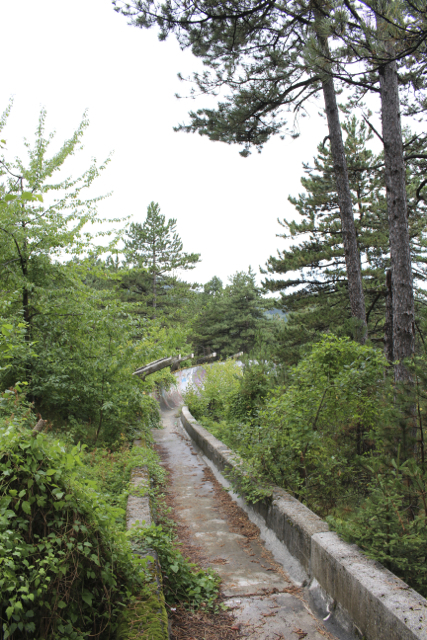 After the bobsled course was built, it was one of the best and fastest bobsled courses in the world but during the war, a large portion of it was destroyed. 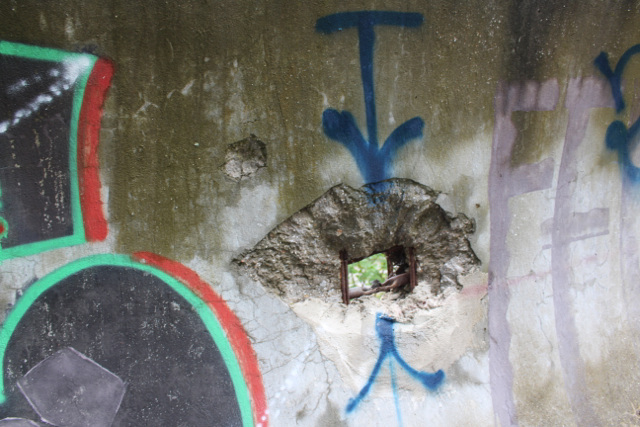 Parts of the course had holes cut into the concrete so it could be used as cover by the Serbian snipers shooting on the civilians in the city. 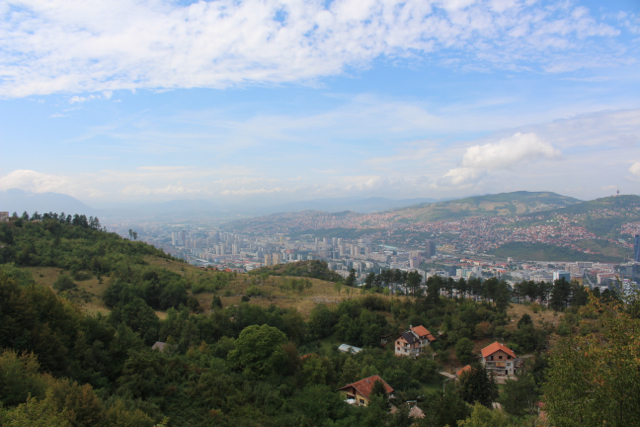 When we left the bobsled course, we stopped at a spot that gives you a panoramic of the city. It is fascinating to see the different sections of the city so clearly based on their architecture. If you look at the photos below, you can see that in the photo on the right, the old city is on the far right. 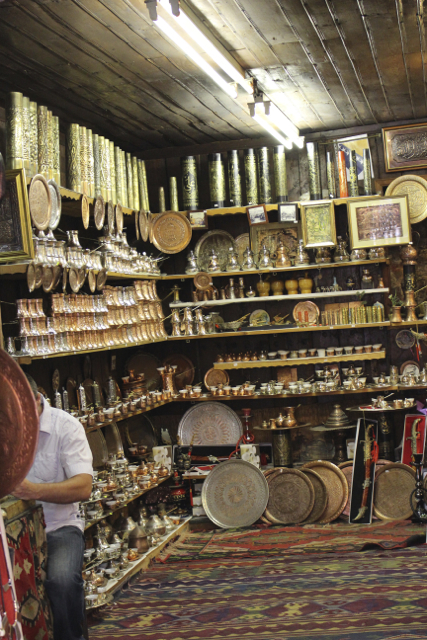 This is the part of town that was built and developed during the Ottoman Empire and has a lot of Turkish influence. In the same photo but on the left side, you can see the Austro-Hungarian influence. When they took over the city, they expanded it out from the Old City and built the new buildings in that style of architecture. 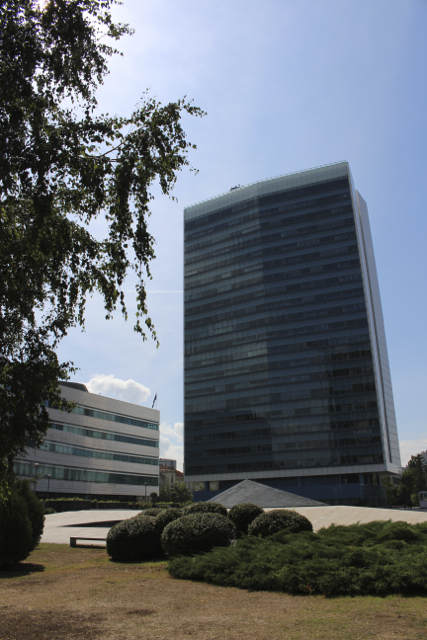 Then in the photo on the left, you can see the Communist style of architecture from the time of Communist Yugoslavia. 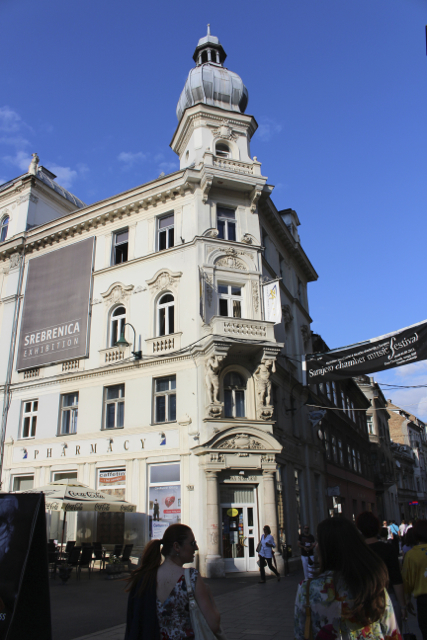 The photo below shows the Austro-Hungarian architecture. 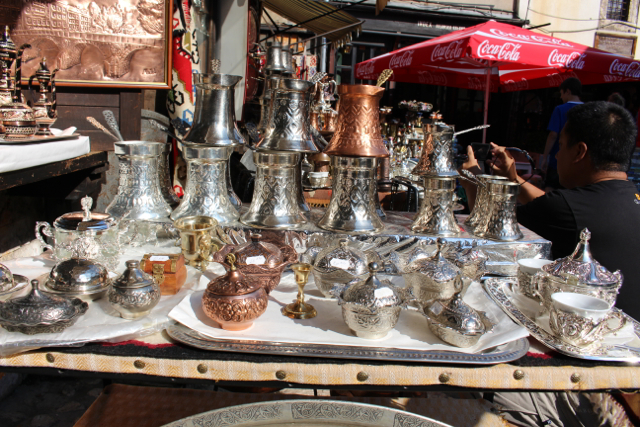 The photos below show the Turkish influence in the city. The photo on the left is the fountain in Sarajevo, the story goes that if you drink from the fountain, you will someday return to Sarajevo. We both drank from the fountain because we are determined to go back someday. After seeing the city from above we drove back down into Sarajevo to visit a few important sites, including the Parliament building. The Bosnian Government is a bit of a mess. There are three presidents, one is Bosnian, one is Serbian, and one is Croatian, that rotate power every eight months, and then there is an EU appointed President that is above all three of them, currently that president is Austrian. There are also 190 political parties and 75% of the country’s budget goes to paying administration. That results in almost nothing getting accomplished for the betterment of the people, a lot of corruption, and a struggling economy. Near the Parliament building is also one a many Sarajevo Roses. 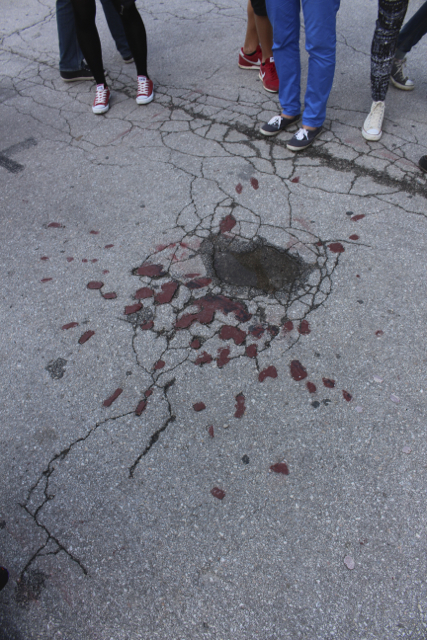 These are parts of the sidewalks that were hit by mortars and have been filled with red concrete in order to remember the blood that was shed during the war. We then drove to visit the Olympic Stadium. It was used for the opening ceremonies of the Olympic Games but now it used as a soccer (football) arena and it has a track as well. Standing in the Stadium you could just imagine the excitement that would have filled it during the 40th Olympic Games and I couldn’t help but see the stark contrast of how it felt now. It is still usable, but unfortunately it didn’t escape the war without damage. To me, the Olympics have always been a symbol of peace, of people setting aside their differences and competing as equals no matter what country, race, religion, or sexual orientation, but unfortunately, even the stadium that represents that peace, couldn’t escape the violence and destruction of war. After visiting the stadium we visited a tradition Bosnian house. 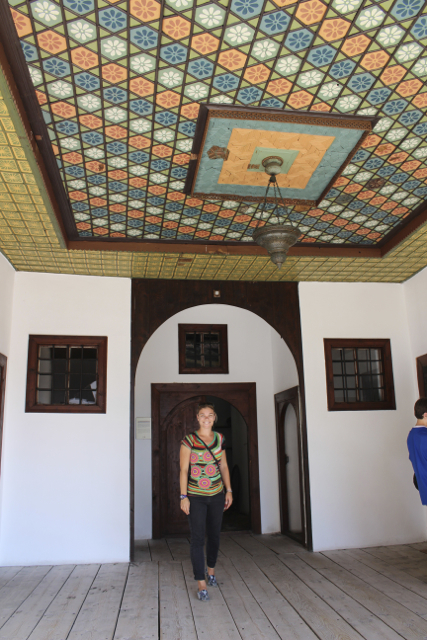 It is now a museum but it used to be owned by one of the wealthier and more educated families in Sarajevo. It was probably my favorite part of the tour. 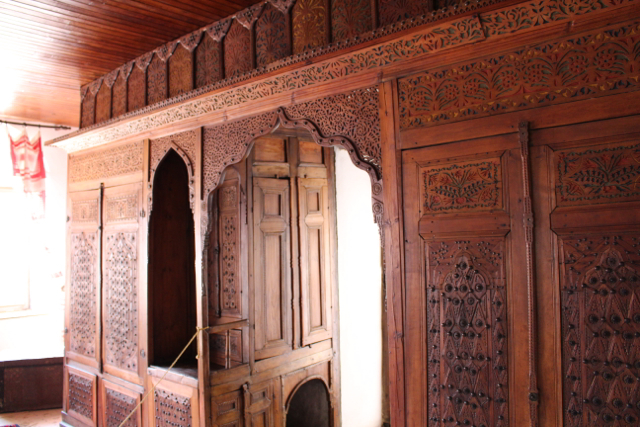 The home was absolutely beautiful; it wasn’t flashy but was filled with understated elegance like intricate wood carvings on the doors and furniture. By the time we were done with all of that, we all had worked up quite an appetite. We went to a little restaurant that was packed with people and served Cevapcici, the traditional Bosnian food that I mentioned in my Mostar post. It was, of course, delicious but I was glad we had a bit more walking on the tour just to prevent myself from slipping into a food coma. 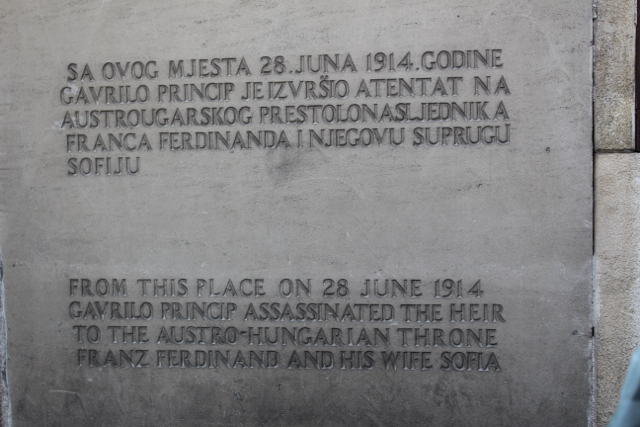 The remainder of the tour, we visited the Library and the site of Franz Ferdinand’s assassination, which resulted in the start of the First World War. The Library was originally built by the Austro-Hungarians but was destroyed during the war and many of the books were lost. It is now being rebuilt in the same site as before. The interesting thing about its location is that at one time, a house stood in its place. When the Austro-Hungarians were looking for a site to build the library, they chose this location and approached the man who lived in the house to ask if they could buy the property and offered to build him a new house in a different part of town. The man declined because he loved his house, but they came and asked him again and again, so finally, he decided he would sell it. But he had one condition, they had to move his house, brick by brick, across the river and build it exactly as it was. The Austro-Hungarians agreed, and in the picture on the left, you can see the library (the striped building) and on the right side of the photo, and a little further back, you can see the house, white with a red roof and green shutters. 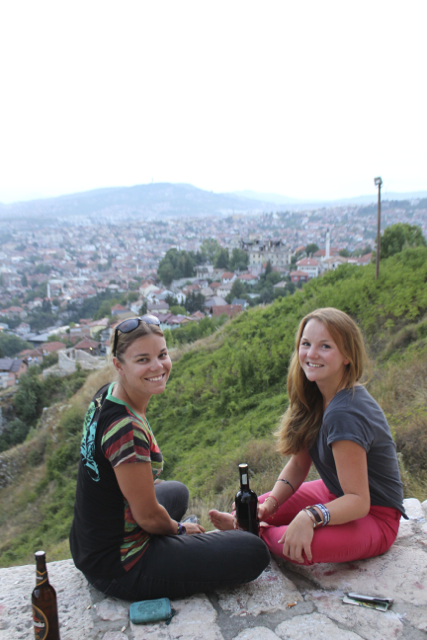 After the tour, we went to a local market and bought a couple of beers and a bottle of wine and hiked up the hill to an old fortress to watch the sunset over the city. It was an absolutely incredible spot that Mike, Kashia, Ronen and I sat and talked for several hours and soaked in the energy of the city. When we went back to the hostel, almost everyone was having a few beers and talking, and the energy was so positive. We all ended up staying awake until 2 or 3 in the morning talking about everything from previous travels and experiences, to philosophical discussions about Wuffins and Duckephants (ask me the next time we see each other if you really want to know), to the importance of enjoying life every moment, and living without regrets. 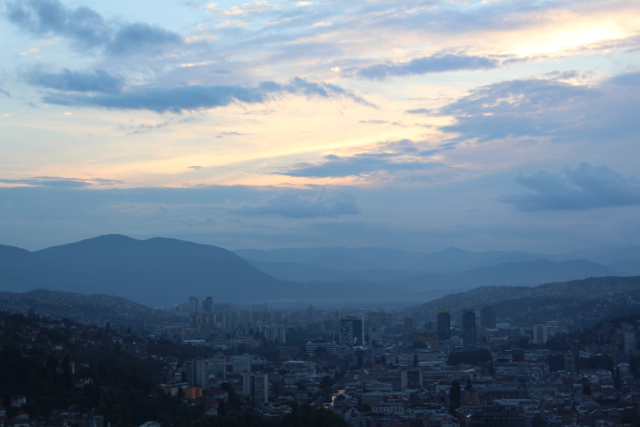 One of the things I have found out while traveling is that there are some places that just grab you, that you just connect with, that move you to the core of your soul, for me Sarajevo was one of those rare places. It drew me in with its soul, with the diversity of people, Muslims, Christians and Jews, as well as Bosnians, Serbs, and Croats all living in harmony with each other, despite the past. I loved the relaxed vibe and the practice of spending an afternoon with friends, drinking coffee and smoking Nargila just watching the day go by. The next day we had grand plans to go white water rafting, which didn’t work out, as well as to go on a hike to a waterfall, which we chose not to do because its 12km one way and it was pouring rain. 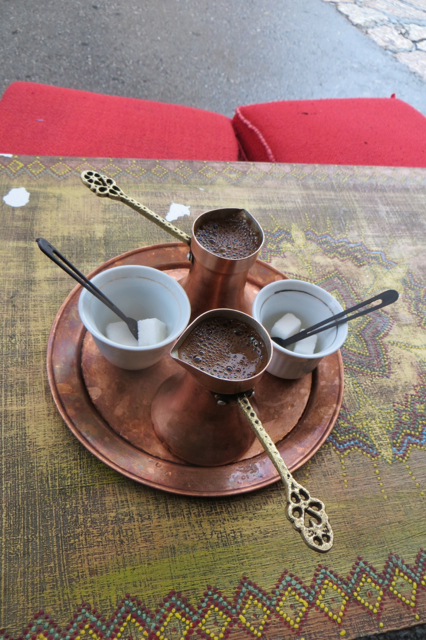 Instead, we found a coffee shop near the square in the old city and drank Bosnian coffee under an awning to keep out of the rain. 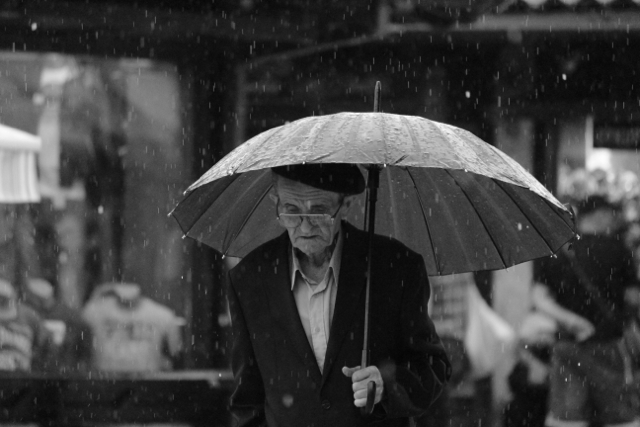 Watching the rain fall down added a magical, somewhat romantic, feeling to the city, boyfriends or husbands, hugging their loved one close to keep them warm and dry under the umbrella, parents lovingly sheltering their children and sacrificing their warmth to make sure their kids were dry. 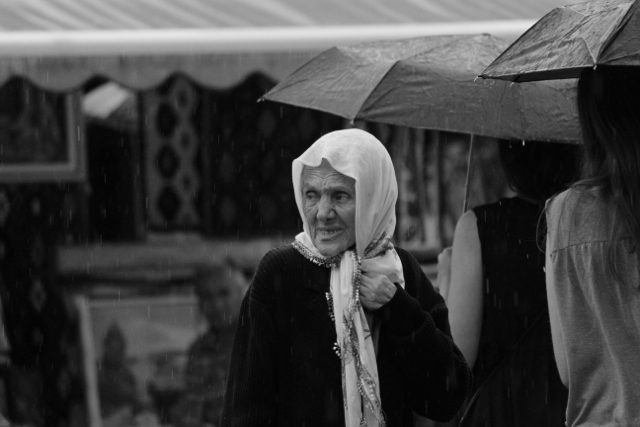 One of the things I haven’t yet mentioned about Bosnia is the gypsies. We were warned upon arrival, not to give the gypsies money because they make more money a night than the hard-working shop owners do. 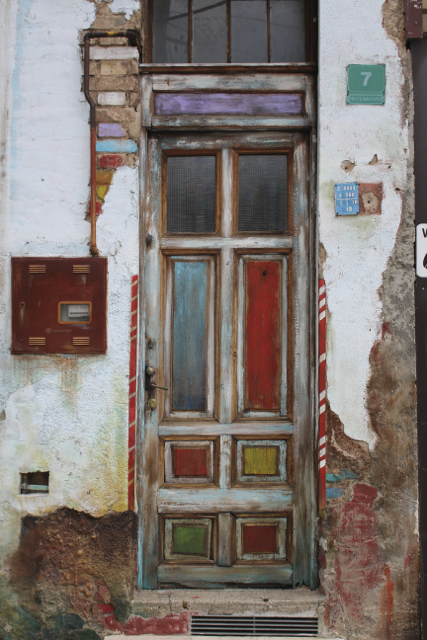 But, when we were sitting at the coffee shop, a gypsy woman came up and asked us for money, we gave her a little bit, even though we normally wouldn’t have. When she heard Ronen cough (he has been battling the same cold that I had) she said she would take him to the Apoteka or Pharmacy because they have a drink there that would cure his cold. Ronen got up and went with her and left me sitting at the coffee shop wondering how long I should wait before I got worried that my husband just ran off with a gypsy. About five minutes later, I saw them walking towards me, smiling and laughing. She had taken Ronen to two different pharmacies looking for the Tajchat (kind of alike an Airborne or EmergenC but in a hot tea form) and then bought it for him with her own money. He of course paid her back for it, plus some for her trouble, but it was such an amazingly kind thing. When they came back to the table, she told me, to hug Ronen, to keep him warm, and snuggle with him so he could get well soon. I am still in awe at her genuine kindness and caring for someone who she knows nothing about and had only given her 50 Cents. 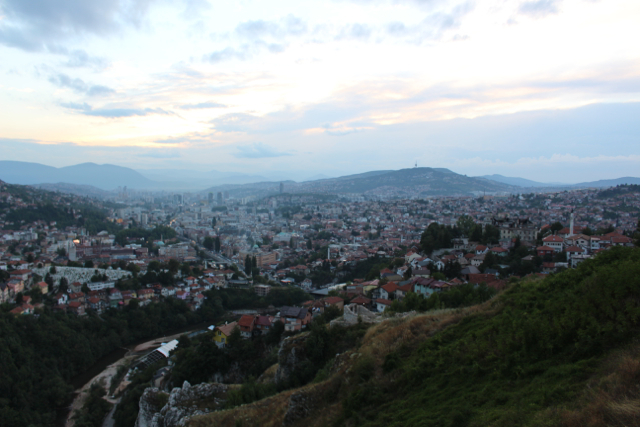 That night was sadly our last night in Sarajevo. We were lucky that it worked out that Haris was having a BBQ at the hostel (he has one every Sunday and Wednesday) and we had the chance to eat some more Cevapcici. The BBQ just added to our experience at Haris Youth Hostel, the hospitality was amazing and we left there feeling like we were leaving home. It was the best way to enjoy our last night in a city that stole both of our hearts. la la la, “She was a gypsy woman” – Love that story as well as everything else you wrote – So authentic and genuine – Makes you want to get on the next flight to Bosnia – So happy you had such memorable times with such lovely people – “Cherish is the word I use to describe” la la la la la la la – I’m so inspired I’m actually singing lyrics which describe your experience – Silly me – Continue to embrace it all and sing your song loud and clear for all to hear!